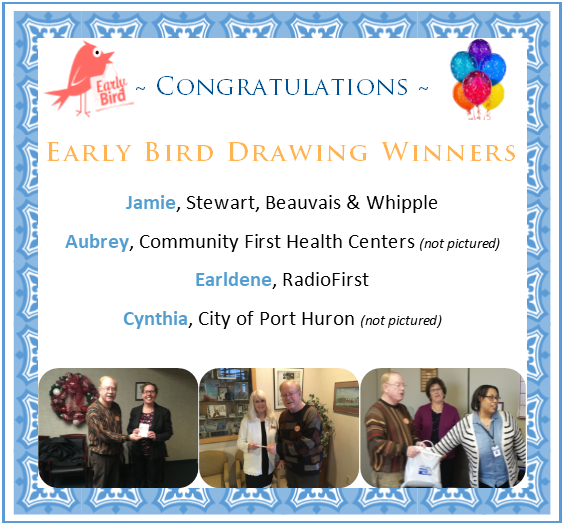 The Campaign Early Bird Drawing is happening again this year and there are some great prizes! Businesses / organizations that have an internal employee giving campaign over $100 that is completed and turned in to the United Way office by November 16th will, once again, have the opportunity to qualify for the Early Bird Drawing. The drawing will be held on November 19th. Every employee that contributes has an opportunity to win. Click Here for a poster to print and display. Employers turn in their completed United Way of St. Clair County Employee Giving Campaign by November 16th. A drawing from among those businesses results in four winners, in the order drawn. Each winning business's contributing employees are entered into a drawing for the prize they have won. One lucky person from each business wins a prize. Prizes provided through various sponsors. Prizes may not be redeemed for cash and no changes or substitutions can be made. Businesses are required to conduct and complete employee giving campaigns totaling more than $100 to qualify for the drawing. Prize recipient must be at least 18 years of age. Prizes are redeemable only for the listed type and at the business stated on the certificate. No changes or substitutions can be made. Special Gifts and Professional divisions: both divisions are entered. 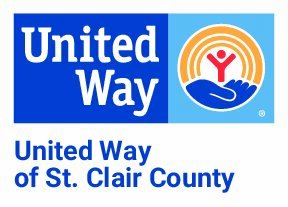 If the division is a winner, the United Way of St. Clair County will draw an individual name from that division. Drawing will be November 19, 2018. United Way of St. Clair County staff will notify the winning businesses and set up a time for a drawing at their facility to determine the individual who will win the prize. United Way of St. Clair County staff and facility representative(s) will put all the eligible contributor’s names in a container and draw the winner.